(Above, L-R): Mandy Brantley, Jarmel Calvin, Kelli Poston, Ashlee Crawford, Seymone Reese, Ashlei Perkins, and Johnna Simpson are all McDuffie County Teacher of the Year award recipients. 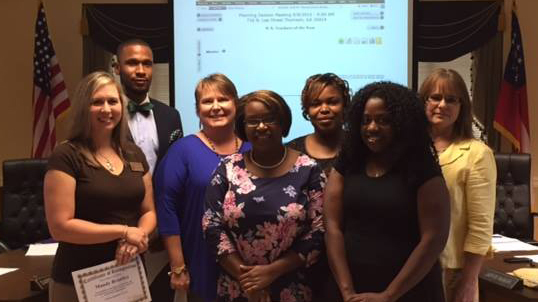 AUGUSTA, GA. – Jaguars roared in McDuffie County when the Board of Education announced its Teachers of the Year. Of the seven schools in the county, five of them chose Georgia Regents University College of Education graduates as their honorees. GRU alumni who are Teacher of the Year finalists are: Mandy Brantley (M.A.T., 2010), Thomson High School; Ashlee Crawford (B.S.Ed., 2008), Thomson-McDuffie Middle School; Kelli Poston (M.Ed., 2009), Maxwell Elementary School; Seymone Reese (B.S.Ed., 2002; Ed.S., 2009), Thomson Elementary School; Johnna Simpson (B.A., 1993), Norris Elementary School; Jarmel Calvin for McDuffie Achievement Center and Ashlei Perkins for Dearing Elementary School. Of the seven finalists, one will be chosen as the McDuffie County Teacher of the Year. The county’s Teacher of the Year will represent McDuffie County in November in Atlanta at the state level. In May, the Georgia Department of Education will name the Georgia Teacher of the Year and the Georgia Media Specialist of the Year.